This shaver has been designed by Remington and it is perfect for men on-the-go. Thanks to its dual foil blades, a close shave is always guaranteed. A pop-up trimmer can deal with other areas such as beards and sideburns. All blades are constructed from stainless steel and the entire cutting head can be quickly removed for washing purposes. One-touch activation and an LED power indicator are other features. Immediate payment of AU $31.20 is required. Happy with service & item! Bulkage good reckon. Gnarly deals dude. Better than a pair of 80’s leg warmers. Clipper is Great, but the razer doesn't seem to work very well charge time bad. So easy to order and then to be able to pick it up at the store was even better. Fast delivery really good thank you very much. I needed it big time. Works well. Good price. The only problem is its a bit hard for elderly man with poor eyesight as the little springs under the cutter can pop out easily and are a bit hard to get back in. Should not be a problem for anyone else though. Old reliable that never fails to deliver. Good value props. This is my second shaver. I liked it so much that when my original one kicked the bucket after years of service, the replacement shaver I got didn't quite deliver so had to get this one again. It provides a close shave and its quiet. The best part though is it's cordless so you can be doing other stuff while shaving at the same time. It's good value. Lasts long and very dependable. This is the best shaver I have ever used . I have been using these for many years and always carry a spare one ready to use when the cutters get blunt, usually after months. it is cheaper to throw out the old shaver and replace it than it is to buy new cutters. I could not fault the performance of the shaver. The battery lasts at least 7 days with use twice a day. I bought it as a backup, secondary shaver or to take it when traveling. 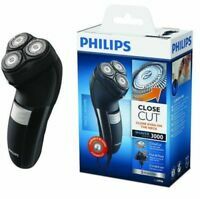 For the price is a good product though it does not shave as good as my 4 year old shaver which was much more expensive. good quality small REMINGTON Shavor. works well.